So if you have been gluten-free or wheat-free for any length of time, you have tried finding bread. When DH and I first tried going wheat-free 9 years ago gluten-free bread was hard to find and tasted worse than dirt. Don't even get me started on the texture! Most were like biting into sand, just plain old gross! So anytime someone gives a gluten-free bread high marks, I am first in line to get it. 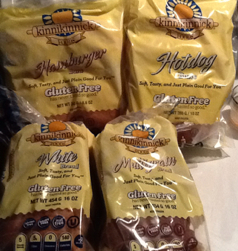 As soon as I started hearing good things about the new Kinnikinnick bread, in the yellow packages, I wanted to try it. When the reviews said it was better than Udi's, I had to get it! So you know I live in the backwoods of deep East Texas, known for pine trees not healthy eating, where the hades was I going to this new bread. They announced it back in March and I still had not seen it anywhere. 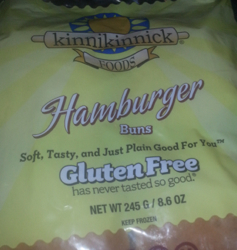 When I saw that Kinnikinnick would be at the Gluten and Allergen Free Expo, I knew this would be my chance to try the new bread! Now let me just get this out there, I was really suspicious of the Kinnikinnick bread. I had choked down some before and just like I said, I choked it down. Seriously, it was awful. To me any bit of improvement would be heads and tails above the old bread line. I decided to keep an open mind but to be honest I wasn't expecting much. I think the tag line, Toss Out The Toaster, was probably the real kicker for me. Even if it taste good, I just knew you would have to toast it so it would not fall apart. I mean we were an Udi's family so Kinnikinnick was going to have to work very hard for our approval. At the Expo I made a bee line for Kinnikinnick, they have to have the new bread. They did but everyone else was also running for the bread. I got a small little piece. It was good! It wasn't toasted! I wanted more but so did the crowd! I was pushed along. No more bread for me :( What is a Wheatless Mama to do? Me, I got brave and sent Kinnikinnick a request to do a review! They said yes! This is what I got in the mail! One loaf of white, one loaf of multigrain, one package of hamburger buns and one of hot dog buns. I was in heaven. What was I going to make first? The thing I had missed most, Grilled Cheese! That's a picture of my grilled cheese. It was good! I gave my mom half of one and asked what she thought. Her words, what are you doing eating regular bread? Yep, it tasted GOOD! The texture was nice and airy not like sand at all. The taste was like fresh white bread. Let me tell you, Ravebaby ate the crust! She always leaves the Udi's crust. I think that says a lot. The bread was so good and soft that she didn't want to leave any. Ravebaby has never eaten "real" bread; she's always had Udi's. DH also loved his grilled cheese. He's not a bread eater anyway but this he enjoyed. Next up, the cold picnic sandwich! Toss out the toaster? Okay Kinnikinnick here is the big test. I have missed cold sandwiches. I grew up with cold bologna sandwiches and really enjoy and have missed them. Not that there is anything wrong with sandwiches on toast but on a hot day, I don't want a hot sandwich! We went all out. Fresh turkey breast from the deli and fancy cheese slices, we were going to do it right. Ravebaby had a playmate at the park so a picnic was perfect. First thing I noticed, the bread didn't fall apart as I made my sandwich. Next I took a bite. The bread did not fall apart! THE BREAD DID NOT FALL APART! It was cold and straight from the package and it did not fall apart! After two years of Udi's, this whole "I don't have to toast my bread" thing is revolutionary. I will say it was just a bit sandy in texture but I only noticed it because I was looking for it. This bread is the real deal! So just as a point of information, there are only four buns per package. This is pretty par for the course for gluten-free items but just wanted to make sure you know. My first impression they were soft and airy. They smelled and looked like 'real' buns. So far so good and then we hit a problem! They aren't cut! They are not pre-sliced. Honestly that would have been the nail in the coffin but, and this is a big but, they tasted fantastic! 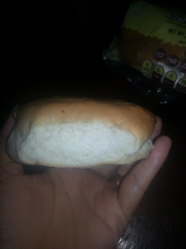 Straight from the package to my burger, no toaster, and it tasted like a good 'real' buns! No texture issue, no grainy sandy feel, just a good bun. It also didn't fall apart like the untoasted Udi's buns. DH seemed to feel that they might be too airy but I didn't have that issue. We tried them again two days later. I had left them in the car but I sealed them pretty well. This time they still tasted good but I did notice a little bit of a sandy feel at the end. Again, no toasting just straight from the package. I thought that was pretty normal since 'real' buns tend to change if left in the car open too. I was hungry and wanted toast. The only thing I had was the multigrain in the freezer. Perfect timing for me. I grabbed two slices from the freezer and into the toaster they went. I like a medium toast and on my toaster that is a four. I thought I would have to put it through twice since it was straight from the freezer. No need. Once my toast popped up, I added butter and jelly and I was in heaven. 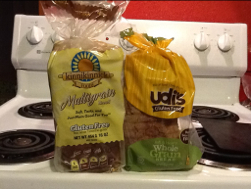 Before going wheat-free I use to eat the 7-grain bread from Petridge Farms and honestly, I had to do a double take. I could not believe it was gluten-free bread. It tasted great, had a great texture and just made me happy. I have some Udi's in the freezer and unfortunately it is the easiest to find around here but after this I'm going to be a thorn in the side of my local grocer until they carry the new Kinnickinnick line. Forget what you know about gluten-free bread. Forget what you had with the old Kinnickinnick line. March down to you grocer and demand this bread. Disclosure: I approached both Udi's and Kinnickinnick for samples. I purchased my own Udi's and have eaten for many months. Kinnickinnick did provide me with a starter package of their new bread line. I have not received any money for my review. Giveaway Time: I'm using Rafflecopper so it should be very self explanatory. Winner will be required to provide address, sorry no PO Boxes, and phone number. Open to US and Canada. I'd definitely have to try a grilled cheese first. Yum! I'm so on a fancy grilled cheese kick! .. With cream cheese and blueberries! Sautee it on a pan like normal grilled cheese. Sooo yum and so quick to make! Who says you can't enjoy eating gf? Oh man, I haven't had a chance to try the new bread yet, but I think I would be in heaven if I did! I've really liked Udi's as the best substitute so far, so hearing this is BETTER makes me really want to try it! I think the first tests will be grilled cheese, a nice burger, and french toast! The first thing I will make is a nice un-toasted sandwich. I am so sick of toasted bread sandwiches. Do you think I could eat this with just butter? I would love a piece of bread and butter. Like all of us, I miss being able to eat like a "normal" person. I hate when they bring out rolls or bread and butter at a restaurant. Can't eat cheese, but I have had a major craving for PB&J. Kinnikinnick SHIPS to you! (I'm biased, and spoiled. I live in Edmonton, Alberta where they have their two bakeries…) But you don't have to go find it! Order from just about ANYWHERE! You can order from the website http://consumer.kinnikinnick.com/index.cfm/fuseaction/products.home.html. Rebecca - you bet you can eat it with just butter… and if you can get a nice fresh organic butter - even tastier! Anyone remember what store-bought white bread used to feel like? This is IT. AND even better for you than ANY bread out there. (Especially GF.) Check Kinnikinnick's website for nutritional info. 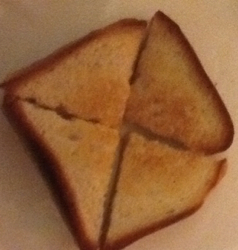 Oh, and fancy grilled cheese - try adding a couple of paper thin slices of apple or pear… really! I hate weird stuff in my Grilled Cheese, but it's goooood. Definitely a grilled cheese sandwich with a fresh tomato, avocado and spinach inside! Thanks!